Flat roofs aren’t truly flat. Rather, they have a slight slope that allows rainwater to drain into the gutters. Ponding water forms when the rooftop doesn’t properly drain, leaving rainwater on the roof for two days or more, despite conditions that allow other areas of the roof to completely dry. Ponding water can affect your roof in many ways. Water can magnify sunlight, particularly UV rays, which can prematurely age the outer roofing material. It can also encourage algae growth, which can cause problems such as damage to the roofing membrane, particularly in the seams. In winter, ponding water can freeze on the surface and exert unwanted pressure as the water expands, similar to how standing water affects gutters. Issues such as dents on the roofing substrate and an incorrect roof slope can both contribute to ponding water, and each of these problems can further be attributed to poor roofing design. This is why carefully planning the roof design and hiring an experienced roofing contractor are vital parts of the roofing process. 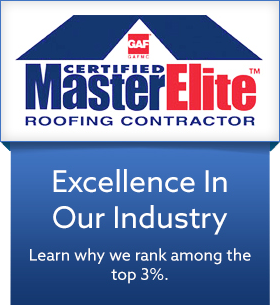 Your roofing contractor should indicate the roof slope, which needs to be at least 0.25/12. The roof substrate should also be built to be perfectly level, without indentations or uneven areas. Many property owners choose to brush ponding water toward the gutters when cleaning the roof, but this can cause premature wear and tear on the outer roofing surface, especially on single-ply roofing. For large roof areas like you find with commercial roofing, this can also cost a lot in terms of man-hours. If you already have ponding water on your flat roof, the best long-term solution is to have it addressed by an experienced roofing contractor. V. Nanfito Roofing & Siding can help you with ponding water, as well as other roofing and vinyl siding concerns. Call us today at (203) 639-1634. You can also fill out our contact form to schedule a free consultation.